Believe it or not, the retro photo is me in the 80’s filming on the beaches of Hawaii. Ok, the outfits were fads, however my career has never been about fads. I believe in common sense sound fitness rules and exercises. Today, I believe and continue to use every exercise on Boomers by Janis. Boomers by Janis contains 3 1/2 hours of “The Team” divided into 7 1/2 minutes workouts to mix/match or use alone. 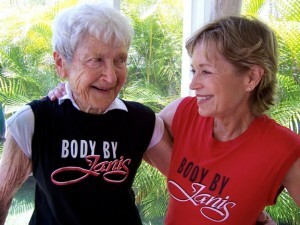 We were a team on every one of the 1000+ Body by Janis Exercise TV Shows. At 72, Anneliese performed every exercise on the Boomers by Janis DVD. Janis’ famous 8 minute workouts (totaling 3 1/2 hours) now available on DVD for only $19.95 plus $5.95 shipping. You will receive over 20 complete workouts for upper and lower body, core strength, stretching and low-impact aerobics to get you strong, flexible and slimmer fast. Mix and match workouts to create a different routine every day of the week. Click below to buy!